CBEC’s Creepy Crawlers programs offer early learning environmental opportunities that have been shown to foster skills that lead to school readiness, positive home learning, and that encourage a sense of stewardship for our planet. Crafted in line with Maryland’s Early Childhood Learning Standards, classes are designed for 2–5 year olds, accompanied by an adult, exploring various topics of the natural world — from critters to composting — through games, crafts, live animals or artifacts, stories, and most importantly, hands-on participation. Creepy Crawlers is a weekly series with sessions offered in the spring and fall. The series format provides a consistent experience for learning, socialization, and communication — skills crucial to school readiness — while parents and caregivers get the added benefit of meeting others like them. Each class includes a home connection element to extend the fun beyond CBEC. 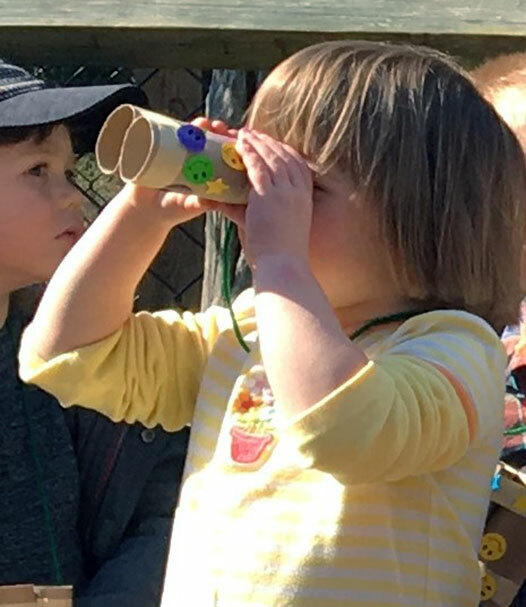 Creepy Crawlers explore nature with their homemade binoculars. Taught by CBEC’s Early Childhood Education Coordinator, Karen Bogue, Creepy Crawlers is a fun, engaging way for your child to learn about critters and nature! The spring and fall series consist of 10 classes at a cost of $75 for CBEC members and $100 for non-CBEC members. Watch for dates for the upcoming mini-session (3 classes) in May at a cost of $22 for CBEC members and $30 for non-CBEC members. Sibling discounts are available. For each session, classes meet on either Mondays or Tuesdays, 10:00 a.m. -11:15 a.m.
Go to Creepy Crawlers for registration, additional information and class topics, or contact Karen Bogue at kbogue@bayrestoration.org. Pre-registration is required. Class sizes are limited, so be sure to register online to secure your spot! Select newsletter Paddlepalooza Little Bobbers Fishing Derby Summer Camp on the Chesapeake Eagle Scout Project Creepy Crawlers Become a Confident Kayaker! Meet Our Board Member Meet CBEC Board Member Merry Tobin Camp News! Creepy Crawlers Expands!